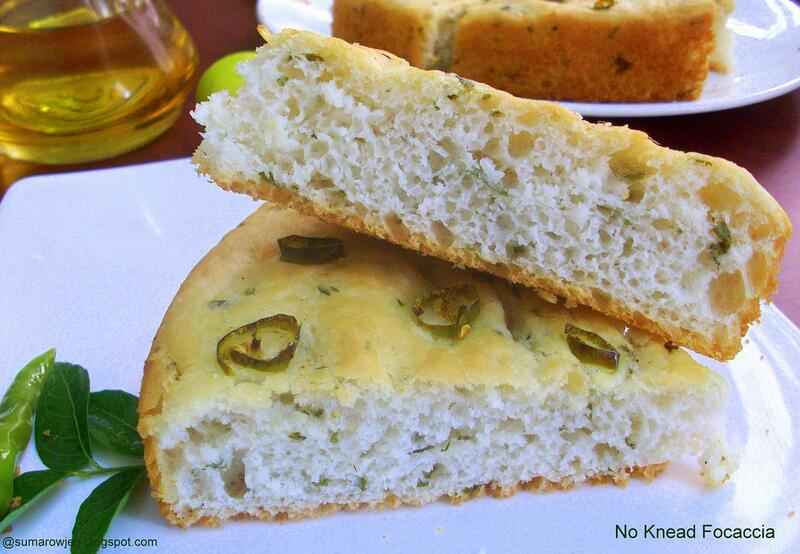 Cakes & More: No Knead Focaccia - Super Quick, Easy Easy And Yumm!! This flat bread has been on my do-to list since quite sometime. What was not on my to-do list today was a post on my blog. But I baked this super easy and quick No Knead Focaccia today and am so very happy and impressed, I have to have to share this with you and TODAY! There are somethings which have to go into the oven within a few hours of seeing a post, in this case No Knead Coconut And Chillies Flatbread on Champa's blog. The flavors of lime, coconut milk and chillies in a focaccia was too much to resist and I had to get this into my oven and FAST! So yesterday was again one of those days when I did not have my system at home as the hard disk decided to crash bang in the mid of a busy week day. I knew I would be jobless at least half the morning, so was all set to bake the focaccia. I don't use a laptop (I prefer the desktop, more sturdy with kids running around), hence normally write down the recipes in a book and then bake. Struggled with hubby's HTC that evening, braved the touch screen (yeah, you now believe, folks like me actually do exist in this age of technology!) and wrote down the recipe. The recipe is a dream, just mix everything together, beat 20 strokes with a wooden spoon, let it rest for an hour in the baking tin and then bake. That's it!!! Isn't that real easy and quick? If everything had gone right, you would have seen this post on my blog yesterday instead of today. Errr.. I had made one small mistake while noting down the temperature, doubt crept in while the dough was resting. Panic calls to hubby and brother to please help me in that grave emergency situation - all they had to do was confirm the baking temperature. Al right, I would have to spell out the name of the blog, etc etc. All they had to do was pause the office work for a few minutes, search a bit, read the recipe and tell me the temperature. But hubby's terse "Am in a meeting, will call you back' and brother's SMS '' Can I do this after an hour" left me no choice but to bake at that wrong temperature (kick-myself, kick -myself moment) and mess up with the result. So today, yours truly just HAD to bake again today and am I so very glad I baked this!! I loved the bread, the texture and the taste. 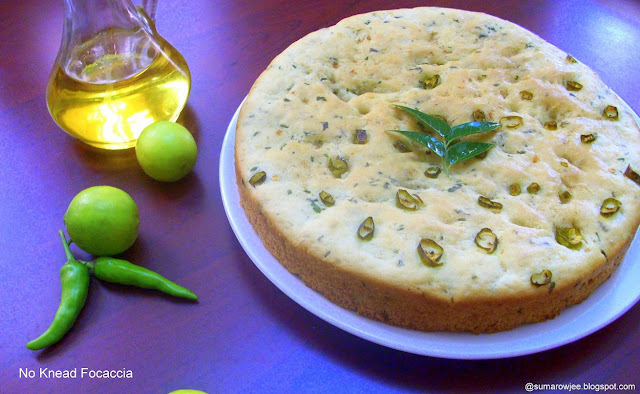 I would have loved it to have more holes in it like Champa's focaccia, but then I know I am being really greedy now. Well, so many more focaccias to be baked, so many more chances. This again is one of those breads apt for a beginner. If you are a beginner looking for an easy and impressive bread to bake for your unexpected guests, this is THE one. I have halved the recipe and baked it in a 9'' round tin (as suggested by Champa) as I do not have a 13x9 pan or an oven big enough to fit it in. I could have probably juggled with two tins and two ovens, but I took the lazy and easier way out. The small changes I made was the addition of hing, roasted methi powder and some grated fresh coconut to the batter. Roasted methi powder adds a wonderful aroma and taste to savory dishes with lime/ lemon. Procedure: Grease a 9'' round tin very, very generously. Heat the 1 1/2 tablespoons oil till hot but not smoking. Add the hing and the slit green chillies. Discard the chillies. In a bowl, mix everything except the ingredients for topping. (if using active dried yeast, you would need to proof it first using the warm water, yeast and sugar, let it stand for about 10 minutes till frothy and then add the rest of the ingredients) Stir till all the flour is incorporated. Then beat 20 times with the spoon. The batter is sticky. Transfer the batter to the greased tin. Push with greased hands to cover the entire pan. Cover and let rise for an hour. Champa says, the dough doubling is not the criteria here, the dough is fine as long as its puffy. Towards the end of the rise period, pre-heat oven to 190 degrees C / 375 degrees F. Dimple the dough with greased hands. drizzle oil on top. (I have heated the oil for topping, added the methi powder and drizzled it when it cooled down) Sprinkle sea salt if using, add the chopped green chillies. ( I have left a portion without chillies for my daughter) Bake for 35- 40 minutes or till golden brown on top. The bottom should sound hollow when tapped. My bread did not brown a lot, but was so very happy to see the thermometer read 204 F after 40 minutes!! ( It should read between 200-210F on an instant read thermometer, get one if you bake breads). I put the bread under the grill for 1 1/2 minutes - for color, told you am greedy! Cool on the wire rack in the pan for 10 minutes, then remove from pan and cool further. Serve warm or at room temperature. Savor!! You are guaranteed to impress yourself and your guests! 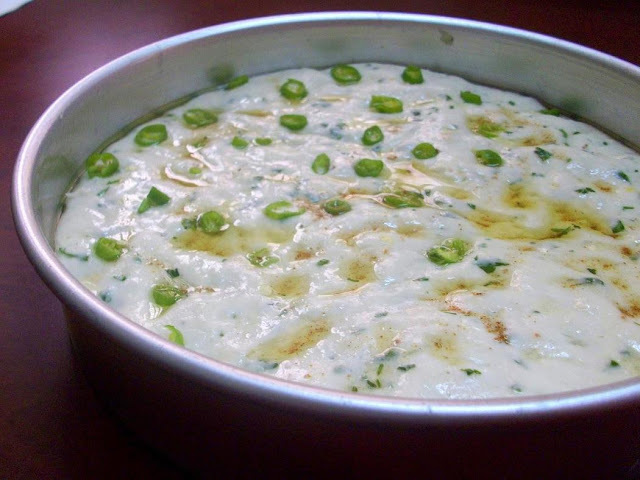 Thanks Champa for sharing yet another keeper of a recipe! Variations: You could omit the coconut milk and use water in its place. Use herbs and toppings of your choice. Roasted garlic, cherry tomatoes, rosemary, oregano, Italian seasoning or just about anything. 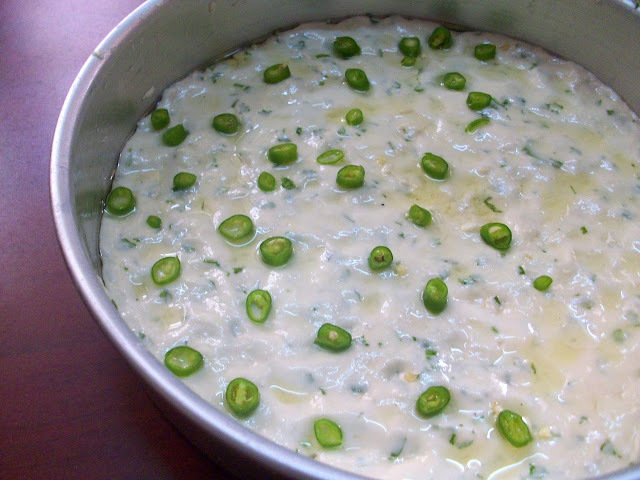 You could chop the chillies fine and add to the batter as Champa has done. I have discarded as my hubby and kids don't eat food spicy. I have instead used chopped green chillies for topping as there are no surprises when you bite into the bread!! Sending the focaccia to Yeast Spotting. And its Passionate About Baking for The Tried And Tasted event now hosted by Lakshmi of Samayalarai on till 31st Of May. I came to know of this only today and yep gotta bake something from Deeba's sea of wonderful recipes and soon!! Have you sent in your entries? Suma, these look awesome. What are you complaining about the lack of holes. There are plenty. Great job. Lovely recipe with excellent presentation. Bookmarked. I'm yet to muster enough courage to bake a bread. Wish me luck. Ok..this one sounds attempt-able! !I love Focaccia and would love to bake one of my own.You used Gloripan Yeast here too,so did you add it along with the dry ingredients?Will mail you with more doubts okies! 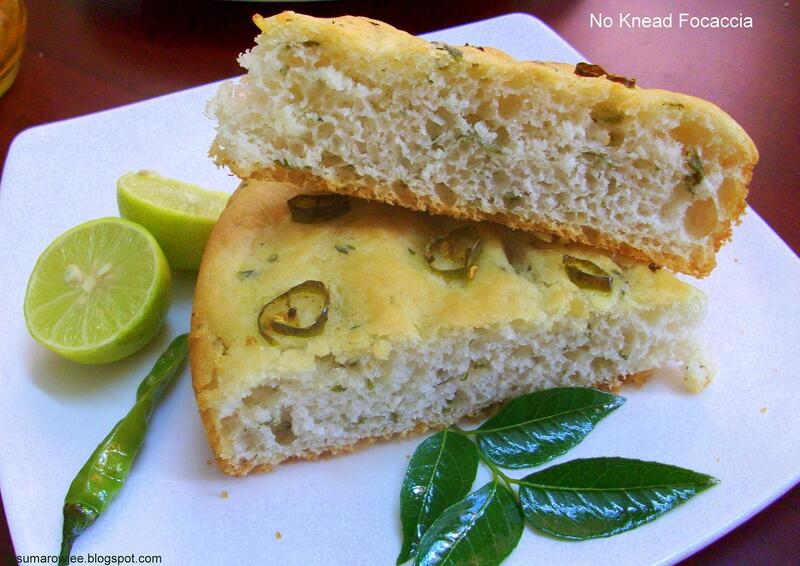 Super simple bread... awesome pics and love your toppings..
Love foccacia, very prefect bread for me to try without any hesitation, love thos toppings..
Amazing clicks and it looks so perfect.Ilove the flavours. Came out super nice despite all the trials n tribulations!!!! This recipe was perfect.Can you please inform me about the use of wheat gluten and bread improver ? Can i use both or any one for bread baking and in what proportion.I am a novice in this field i will be obliged by your information. @Abha - Vital wheat gluten helps improve the texture of the bread. You can use 1 tbsp of gluten for one cup of flour. You can get this in IBCA, Bangalore, they also courier to other places. Do check my Baking in Bangalore post for more details. on which rack of the OTG should it be baked and with both the elements on the of oven or only bottom element on while baking? hope for the earliest reply. Crisp Spicy Flatbread - Crackers?? Coffee Cream Cake - For Me !